On October 6, 2003, Coast Guard units everywhere took the time to remember the loss of one of our own – a loss that occurred in Vietnam 35 years ago. On June 9, 1968, Coast Guard LT Jack Rittichier was shot down over Laos, Vietnam while attempting to rescue a downed Marine fighter pilot. LT Rittichier was serving with a U. S. Air Force Combat Air Rescue detachment as part of a pilot exchange program. The crash site of LT Rittichier’s helicopter, as well as his remains, were only discovered this past spring. On October 6, with his family members present, LT Rittichier was finally laid to rest with full military honors in Arlington National Cemetery. To honor the return home and burial of the Coast Guard’s only MIA from the Vietnam War, Coast Guard units were directed to lower their American flags to half-staff. 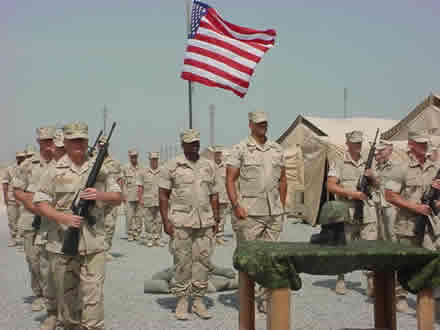 At Camp Spearhead, Kuwait, some several thousand miles from Arlington, the story was no different. There the members of PSU 308 also remembered. 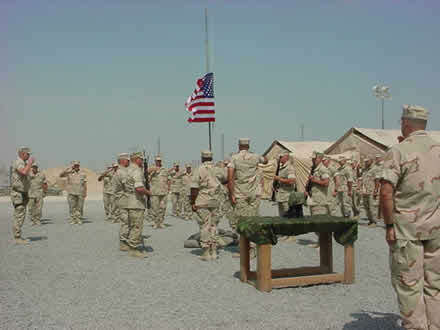 Despite a heavy operational tempo, members of the unit used their off-duty time to assemble an Honor Guard detachment and organize a formal ceremony that would have made the Rittichier family proud. With the ceremony over, the unit dispersed as quietly as it had assembled. The flag remained flying at half-staff throughout the remainder of the day. 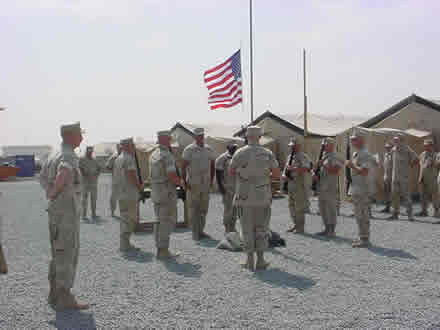 At sunset, the members of the Honor Guard returned to retire the colors. For PSU 308 the ceremony not only represented a remembrance, but a bonding as well – a bonding that linked two moments in Coast Guard history, the Vietnam War and Operation Iraqi Freedom. For two of the unit’s Chief Petty Officers who are Vietnam veterans, the ceremony also provided a connection to many of the men and women of PSU 308 who were born decades after the Vietnam War ended. For all, it provided an indelible lifetime memory. 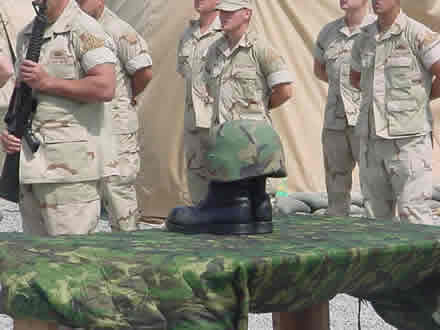 LT Rittichier’s service in Vietnam. a hand salute to honor LT Jack Rittichier.